Interesting article about Katarina Johnson-Thompson of the United Kingdom. Memorable passage: In truth, it was hardly a fair competition. 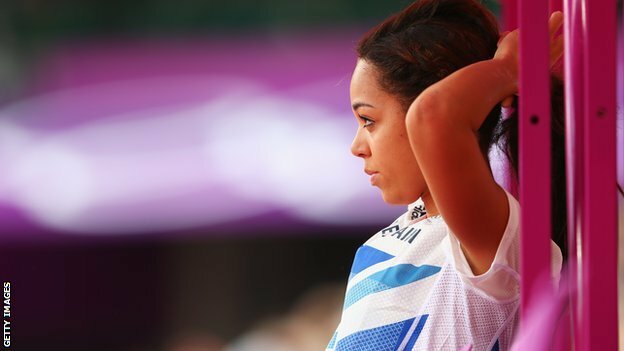 One day Katarina Johnson-Thompson was among the sporting elite, buoyed by the roar of 80,000 supporters in the Olympic stadium, the next she was just one of a room full of students, slumped in her chair. Silent but for the voice of a teacher. This is a growing trend among youth athletes. Thoughts? Most people use educations to make money. If young athletes Ajee, this example, etc can make more money in athletics then I feel they are very justified in putting off education. Plus, education really can wait. I think there is a double standard sometimes about following your passion. These kids are likely told that from a young age, but then when their passion isn’t the status quo, they are ridiculed. I agree with CrossHare, I think that school can definitely wait to pursue your passion, especially in a sport where there is truly only a certain window to capture the highest honors. Is it really a trend or do we just spend too much time following our sport and thus we notice these individual cases? Rupp was going to skip college but then didn’t. Felix didn’t compete in college but finished her degree I believe in less than 4 years. Webb dropped out but then continued I think at George Mason but I don’t know if he finished. We don’t know what Cain will do. Ajee Wilson did go pro. Apart from this very talented British athlete am I missing some folks? Did Jager drop out? Wilson and Johnson Thompson at least share in the fact that they won World Juniors (Gunnar Nixon did too - perhaps he will go pro) and Johnson Thompson actually competed in London too. Nice Hep best of 6267. Jager was (no idea if he still is, or whether he finished) taking classes at Portland State last I heard. There is a lot of social pressure to go to college, even if you’re competing as a pro. Everyone else your age, probably everyone you can relate to is in college. Plus training probably takes 5 hours a day, tops, so it leaves a lot of free time. Probably why people like Webb, Jager, LV (I think) who go pro before finishing an ncaa career take classes anyways. I wish more would do it quite frankly. Making the Olympic team while you’re a full time student is possible, but you cant say it doesn’t hold you back. It’s happened obviously, and there are plenty of examples to prove it can be done. I probably wouldn’t do it if I couldn’t do the the Olympic A consistently in my respective event. But if you can hit the Olympic A, and you’re 19, screw it, make some money and take 1 or 2 classes online to get some credits out of the way and shoot for the Olympics. I don’t think Jager really had the credentials (he certainly had the potential) to go pro when he did. Luckily it panned out with him running 13:22 the next year, but I think him going pro was more because Schumacher headed west and Jager wanted to follow his coach. I also wouldn’t be surprised if Schumacher had talked to Nike and requested a contract for Jager as a condition for his relocation. If you’re good enough go for it, if it’s a pipe dream then stay in school.